The scuba diving mask is the most important piece of equipment you can buy. If the mask leaks, it is junk. With that said what makes a good mask and how do you know if it will work for you? Now I realize this list is different than the one you might have come up with. As a Scuba Instructor, I have eliminated those little goggles that some shops sell. Without a nose pocket, you really cannot use those mask under water. Now I have differentiated snorkeling mask from scuba mask, and several of my instructor friends might raise an eyebrow or two. Snorkeling Mask usually has side windows. Now before you go crazy, listen to this. A diver really cannot see out those side windows. Those side windows move the front plane of glass further from your eye, thus limiting your field of view. Snorkelers love the side windows because they allow more light in. Scuba divers prefer low volume mask because they are easier to clear water from. The purge mask has a one way water purge valve installed in the nose pocket. 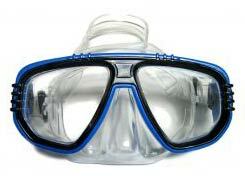 This type of mask is popular among underwater photographers and commercial divers. The purge allows a scuba diver to eliminate water by just blowing air out their nose. This keeps their hands free to hold their tools or camera. In the old days these purge valves used to leak, but now days with the improved silicone, they hardly ever leak. The full face mask is beginning to gain popularity. At one time they were used just for underwater communications. I have found they also help with claustrophobic divers and are very comfortable under water. If you need a prescription for your scuba diving mask , you will need to select a mask with two planes of glass (one for each eye). Make sure that the mask supports prescription lens before you buy it.